Samsung has pumped out quite a sizable number of smartwatches in the past year, today announcing the sixth wearable in their Gear line-up: the Gear S. The device features a square, curved 2.0-inch AMOLED display, and runs Samsung's in-house Tizen OS rather than Android Wear. The Gear S differs from other smartwatches in that it offers built-in 3G connectivity, which allows it to sync with a smartphone even when it's out of Bluetooth range. Paired with its suite of fitness software including S Health, Nike+ Running and even Nokia Here Maps navigation, the Gear S could be a great wearable for tracking your health at all times. Hardware-wise the Gear S has a 1 GHz dual-core CPU, 512 MB of RAM, 4 GB of internal storage, and a 300 mAh battery that is apparently large enough for two day's usage. The whole device is IP67 water resistant, and there's a huge range of sensors included from an accelerometer and compass to a heart rate sensor and UV sensor. 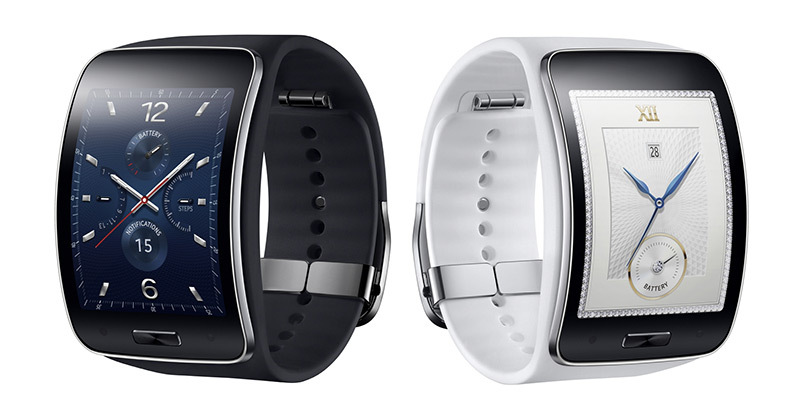 The Gear S will go on sale in October for an unspecified price. It'll slot into the Gear line-up alongside the original Galaxy Gear, the Gear 2, the Gear 2 Neo, the Gear Fit, and the Android Wear-powered Gear Live.